For more than one hundred years, high school basketball has been a big deal in Indiana. As we learn in ATTUCKS!, during the Roaring Twenties, many towns built high school gyms for hosting basketball games that seated more people than their entire town. It was in this setting, during the Great Migration, that the Klan-infested Indianapolis school board voted to build a blacks-only high school in order to rid the other city high schools of black students. Community leaders tried to stop it in court, but all they could accomplish was getting the new school named after the black Revolutionary hero Crispus Attucks (instead of the slaveholder Thomas Jefferson). ATTUCKS! features a lot of basketball and a lot of racism. It’s centered around Crispus Attucks High School, its famous basketball coach, Ray Crowe, and its most famous basketball player, Oscar Robertson. It was Ray Crowe’s innovation, playing Robertson at guard, despite Robertson’s height and shooting ability, that led to the evolution of the modern point guard position in professional basketball. And it was the 1954-55 basketball season--played in the wake of the U.S. Supreme Court’s landmark Brown v. Board of Education decision--that made all-black Attucks High School, Coach Ray Crowe, and star player Oscar Robertson all famous. In the end, the other high schools in Indianapolis were integrated because Indiana was a basketball-crazy state and the other Indianapolis high school basketball teams could only become competitive by recruiting promising black players to their schools. A triumphant story, ATTUCKS! features exciting sports writing and high-interest nonfiction at its best. P.S. This Saturday, November 24th, Oscar Robertson celebrates his 80th birthday. I was thrilled to receive a review copy of ATTUCKS! 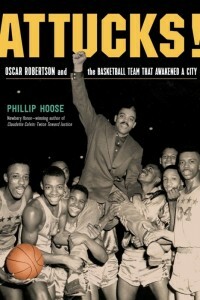 OSCAR ROBERTSON and the BASKETBALL TEAM THAT AWAKENED A CITY by Phillip Hoose. I appreciate that in Attucks, Hoose owns his whiteness and lack of exposure (in his youth) to People of Color, specifically African Americans. He admits that he thought the name of the all black high school in Indianapolis was Christmas Attucks (which is a terrible reflection on the U.S. History being taught at his 99.9% white high school across the river in Speedway, Indianapolis). So, as a white woman and ex middle school girls' basketball coach (my main role was to repeat the other coach's instructions in my hard-to-ignore 'playground voice') I was very eager to learn about this team that forever changed high school basketball in Indiana. Let's start with the positives (this is how book award committees normally work and I like that format). The book focuses on Oscar Robertson, the star player for the Attucks team and considered "the greatest basketball player ever in Indiana." "You know," Oscar said, "when the Ku Klux Klan started our school, they really didn't understand what they were doing." He emphasizes the power of the KKK, specifically in the person of D.C. Stephenson who (accurately) stated, "I am the law in Indiana." 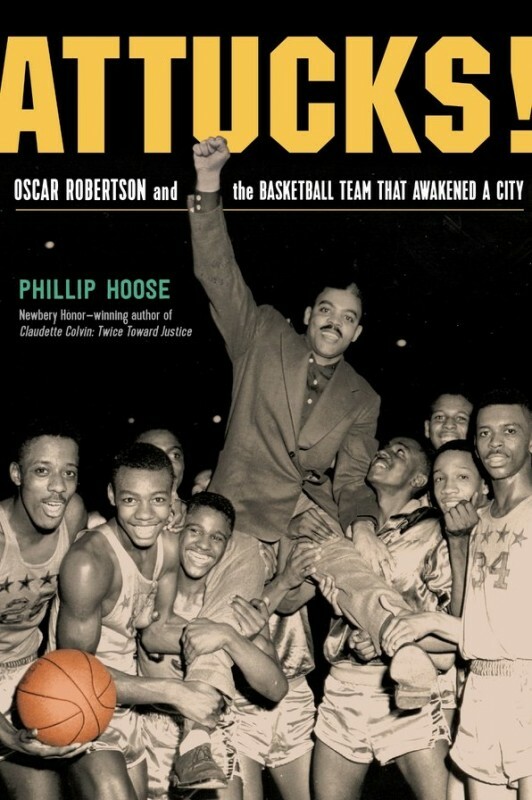 (p.18) Hoose's recounting of the opening of Crispus Attucks High School in 1927 through the winning, culture-changing basketball teams of the mid 1950's shines a light on a little known, little written about, chapter in Civil Rights History. BUT, some language choices and errors jumped out at me, and if I (a 56 year old white woman) saw them, there are probably other errors that will jump out at PoC. Protruding eyes are often used in caricatures or mocking portrayals of African Americans, so it's a descriptor I would leave out unless Robertson had Graves' Disease and Hoose was listing symptoms. To make this more disturbing (to me), there is a photo of Robertson on this page and the word 'protruding' is not even vaguely accurate, so why is it used? Further in the book (p. 135) Hoose is talking about Attucks High School playing Muncie Central and the betting going on about the game. he states, "It was a game over which a great deal of money changed hands--black dollars and white dollars. Attucks games had long been heavily wagered, with racial prejudice driving many white fans to bet with their hearts rather than their heads against a black team." I'm aware that what he is saying is that their emotions, specifically hatred and racism, had them making unwise bets. However, being guided by one's heart normally has positive connotations. There are some big inaccuracies or miscommunication in the text as well. Put like that, it sounds as if President Nichols is incredibly racist and supportive of the Association's decision. In fact, the HEADLINE on p. 102 states: REFEREES' PREJUDICE EXPOSED BY OFFICIAL OF ASSOCIATION! In other words, President Nichols was incredibly angry about the vote and immediately called out the racism of a majority of his groups' members (Ah, if only a current organization would call out the racism of a majority of its members, *cough* GOP *cough*). Is this a huge error? Well, not huge, but it's an error that shouldn't have happened, given the correct information is in the PRIMARY SOURCE material in this very book. On this same page (p. 100) Hoose states "The (Attucks) Tigers never saw a black referee." BUT, when we look at the primary source (newspaper article on p.103) it says "McPeak is certified by the Indiana High School Athletic Association (IHSAA) and has worked a number of high school games here. His latest assignment was the Attucks-Ladoga contest..."
I'm not sure why Hoose made these errors. Is it to make the racism seem worse? The bigotry is heinous and blatant already, so there's really not a need to attribute racism to a man who fought it (Nichols) or create a situation that didn't exist ("never saw a black referee"). All in all, ATTUCKS tells a fascinating story and I'm glad to have learned this history. It disturbs me though, that I cannot truly trust all that I read, since it seems to me that care was not taken with the facts or language in this book. By winning the state high school basketball championship in 1955, ten teens from an Indianapolis school meant to be the centerpiece of racially segregated education in the state shattered the myth of their inferiority. Their brilliant coach had fashioned an unbeatable team from a group of boys born in the South and raised in poverty. Anchored by the astonishing Oscar Robertson, a future college and NBA star, the Crispus Attucks Tigers went down in history as the first state champions from Indianapolis and the first all-black team in U.S. history to win a racially open championship tournament―an integration they had forced with their on-court prowess.